Using swimming pools, whether for exercise, therapy or recreation, is beneficial to both able bodied and disabled people alike. That said, unless a swimming pool is in a rehab center, it's unlikely that it is designed for access by people who are confined to a wheelchair. Pool lifts can be of use to anyone who has difficulty getting into a pool whether or they use wheelchair, walker or are just unsteady on their feet for any reason. 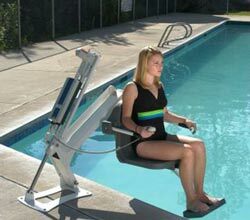 There are several styles of pool lifts for different applications. They can be for in-ground or above ground pools and mounted on or in cement or wooden deck surfaces. Pool lifts can be installed as part of the pool installation or after the fact as an after market item. Note: all accessories and options are not available for all bath lifts. 1) Transfer slings come in a variety of shapes and sizes to fit almost anyone. Many companies will even create a custom sling if their standard slings do not meet the user's need. 2) Hard seats are an option which can be used instead of a transfer sling. They are easier to use than a sling but not as secure for the user. 3) Extra wide hard seats. 5) Hydraulic ram operation is an option for some models although the majority of pool lifts are operated by a battery operated ram. 6) Surface mount anchors are used to mount the pool lift to the deck or patio which surrounds the pool. They are designed for either wooden or cement surfaces. 7) Flush mount anchors are designed to be mounted in the deck or patio surface thus not creating a tripping hazard when the lift isn't in place. 8) Head rests are available for slings or hard seats for those who require extra head support. 8) Additional chargers and batteries are available for electric models.